It’s official. Crane Engineering is now part of ESi. A multi-disciplinary firm, Crane Engineering has a forty-year track record of providing industry leading forensic engineering and investigation services to clients for accident investigation, industrial applications, insurance subrogation and product liability litigation. Expands and diversifies our portfolio of services – The Crane Engineering team brings high caliber technical talent in a range of high growth and complementary areas, further broadening and diversifying ESi’s service portfolio and adding strong sector expertise in automotive and vehicle technology, oil and gas, fire protection, building science, manufacturing, and transportation. Crane also adds to ESi’s suite of data acquisition and forensics capabilities, augmenting a core competency ESi will leverage across its global client base. Supports strong growth in Civil, Structural & Environmental and Fire & Explosion practices – This acquisition is well-timed to build on the strong year-over-year growth in our Civil, Structural & Environmental and Fire & Explosion practices. Finding top technical talent continues to be a high priority, and the Crane team adds specialized domain expertise in building design, materials, systems and components, and fire behavior, prevention, equipment and suppression. Establishes a local presence in the upper Midwest – This acquisition accelerates ESi’s strategic geographic expansion in the upper Midwest. Crane’s reputation for excellence gives ESi another well-established, local presence in a region where there is a growing demand for ESi’s services, bolstering the company’s ability to provide rapid local response. Enhances global reach and flexibility – Together, ESi and Crane have developed an integration plan that is already bringing the benefits of this acquisition to clients on several large-scale projects. Not only does this confirm the natural fit between the two companies, but clients have had an opportunity to experience firsthand the advantages of this increased local responsiveness and expanded global reach. To hear more about what this acquisition means for our clients, check out our video here. At the end of January Crane Engineering had a great turnout for our first annual Crane Smart Sessions: Topics and Trends that Matter. Our two-day seminar included fourteen Crane Engineering presenters with decades of experience in forensic engineering and consulting services for insurance claims, subrogation, manufacturing defects, product liability litigation and industrial applications. 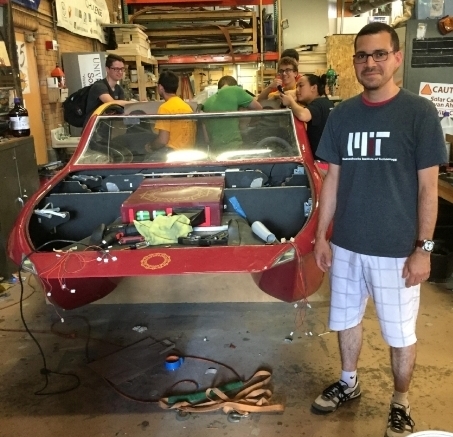 Last week, Hernan Mercado-Corujo, PE, CFEI, CVFI had the chance to perform the Roadworthiness Certification of the University of Minnesota-Twin Cities Solar Vehicle Project, EOS II, (https://umnsvp.org/) as they get ready for the 2017 Bridgestone World Solar Challenge in Australia. Great job and good luck! Engineering Minnesota publishes an article by Curtis Beloy, P.E. Check out page 8 of the current issue of Engineering Minnesota magazine (Vol. 51, No.9) in which Curtis Beloy's article, Testing Firm Has Key Role in Lawsuit Against Motorcycle Manufacturer is featured. For more information email Curtis at cbeloy@safetyengineering.com. Curtis Beloy featured in Cycle USA magazine! Check out this great photo of one of our mechanical engineers, Curtis Beloy, P.E., featured in the July issue of Cycle USA magazine. Crane Engineering/Safety Engineering Launch New Website! Crane Engineering and Safety Engineering have launched our new website. In an effort to better reach our audience on mobile devices and social networks we have redesigned our website focusing on clean and simple navigation. Check out our service offerings, latest news and events at www.CraneEngineering.com. Hernán Mercado-Corujo, P.E., CFEI, CVFI is a leader in STEM advocacy in the Twin Cities. He has been involved with the Society of Hispanic Professional Engineers since college, and with SHPE-TC for the last two and a half years, serving as President since July of 2015.